Renaissance Men, to be certain. Forgot to mention your comment! The opus 118 you are playing is such a beautiful piece! Kissin is an extremely talented pianist; there is a recording of Brahms variations, of which he played at a very high speed and precision! Indeed the Brahms Variations are very difficult...quite a rare case for Brahms. If we have the chance to (play well enough? ) and record these, we will post them here! Last edited by Aop Aur on Mon Dec 18, 2017 2:55 pm, edited 1 time in total. the skinning then the armour belt. As you can see, we've already made the armour belt out of putty with the guide of the plastic frames, so this should be okay as well. Keep show us your progress! It's been some time since I posted my progress. 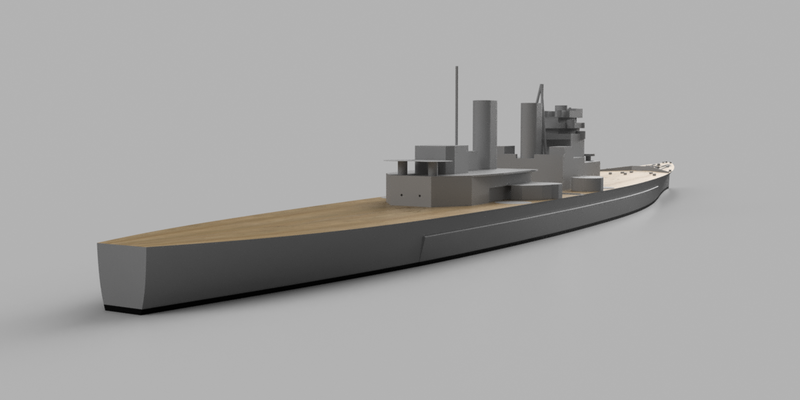 I decided to stop working on the scratch-build 1/700 Lion hull as I discovered a new software made by Autodesk called Fusion 360. The old 123D Design software I have been using was also created by Autodesk, but is no-match in terms of CAD capability in comparison to Fusion 360. Being more of a simplified Fusion 360 than an improved Tinkercad software, 123D Design can almost get a bit annoying to work with if you’re used to Fusion (or other larger CAD programs, we have to assume). In Tinkercad you’re so blatantly aware of your major limitations that every feature is a godsend, but in 123D Design there are all these smaller and more subtle limitations which you discover after a while which can almost give you a bit of a headache. Let’s talk about the major differences first. In 123D Design you don’t have the render, sculpt or CAM modules (among several others), which you all find in Fusion. The browser is not present in 123D Design where you in Fusion have a good overview and management over each instance (components, bodies, sketches and so on). This is essential to have if your assembly consists of several components and extremely convenient to have regardless of the assembly size. You also don’t have anything close to the “capture history”/parametric modelling feature in 123D Design which you have in Fusion. All of the movement, joint and animation-related features are left out of 123D Design as well. I would like to add that the 123D Design software is not capable of handling complex designs, and barely manages a propeller, so a hull is out of the question. Fusion 360 is not a free software. The price for subscription is $40 monthly and $300 yearly. Fortunately, you can subscribe for a free license if you are a small business making less than $100,000 per year (or equivalent), or a hobbyist using Fusion 360 for non-commercial purposes. I know very well that I would make only a few hundred bucks or even less per year from the software, so with these being said, I downloaded the new software right away. After considerable struggles, I managed to finally create a good-looking waterline hull. 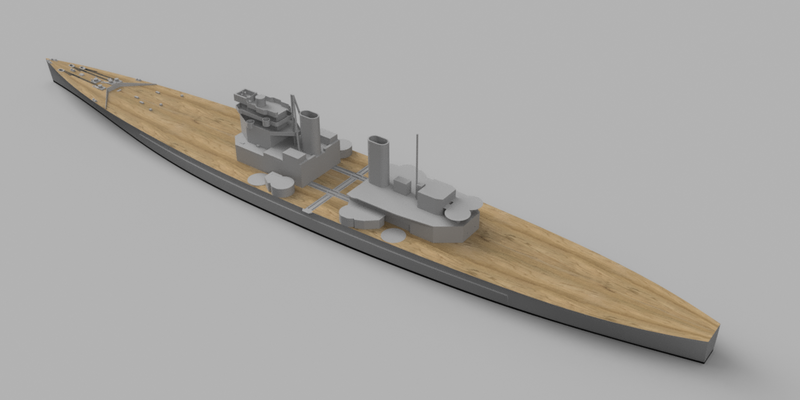 The reason for the waterline option is that we and Richard Harden have agreed to make the kit a waterline version, saving me from the fact that I have not figured out how to design the lower hull! Reasonably, the lower part proved to be much more problematic as the curves are much more complex, let alone features like the rudder skeg and axis, bilge keel, etc. Another factor is that even the National Maritime Museum's hull line drawing isn't 100% accurate for the reason that it was hand-drawn, so several areas had to be modified, and even redrawn, to make each line of the whole structure conform to the same resulting shape. Here are pictures of the hull, still in process. I would need to make a lot more tweaking, which I still haven't figured out how to do yet! Quite a steep learning curve! Here is the "A" turret underway based on new references from NMM. I'm experimenting the lighting and rendering with the new software...so now the turret sits on a dry lakebed at dusk with a lamp on! 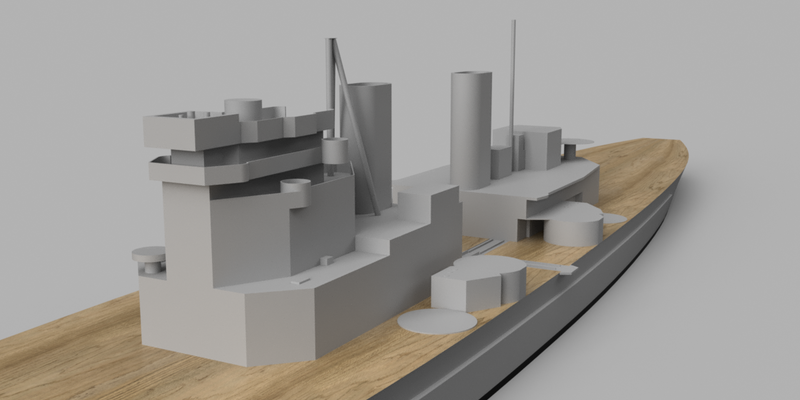 I have made some further progress to the bow area forward of the first breakwater, using photos of the KGV class as a reference. The anchor hawse pipes required a new designing technique, similar to car headlights in tutorial videos. More details will be added later..... Enjoy the pics! More progress on the Lion today... I actually adjusted a few other spots here and there as well as adding dozens of portholes, but the software somehow froze and I was redirected to the sign-in menu! Quite a wasted effort! All the structures are still in their preliminary shapes. I decided not to import old superstructure pieces that I created in 123D design for the reasons that I bought a new drawing from NMM and the new software is much faster to work with as you can import pictures and trace lines on the drawings. is much faster as you can The catapult was drawn from the NMM drawings, as well as PRDobson's 3D KGV pics (Thanks Paul!) and photos of the real ship herself. The masts still need to be corrected using Garzke and Dulin book and KGV photos as a reference, as the NMM drawings only provide a few basic lines. My brother Aur is picking up the turrets design from where I left off, so....more to come! I save the drawing just about every time I have to stop and consider the next step. That way I don't lose much if something fails. Of course, I always do this except for the really long work session just before the machine crashes! Thanks for looking in and commenting, Phil! I certainly remember the rule, but I was simply carried away with all the wonders and awesomeness when each part and detail emerge, just when the screen turns "white." Nevertheless, something much more terrible happened when my mother was driving and braked hard, and my computer with the flashdrive still plugged in fell. The flashdrive broke in two and started losing data! I just had to search on the net to find that typing "*" could restore information history! I was on the edge of losing all my Lion references! 3D modeling is quite a challenge, especially for beginners (or shall I say self-taught, as it's been a few years since I have picked up 3D!) like me. The complex geometry of the hull is very difficult, as you have already mentioned in your step-by-step e-mail message, which I really appreciate you taking the time to write! Also many thanks to the available YouTube videos out there which tremendously helped me starting off confidently with the new software. There is still a problem with the bow area, as one could see a very faint line seperating the foremost bow portion from the rest of the hull. 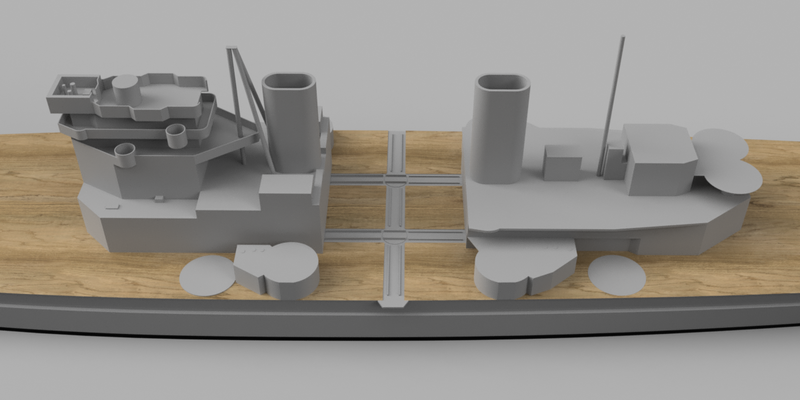 I drew all the cross sections and lofted them together, but the software did not allow lofting the entire hull in one, so I had to make a seperate bow piece, which resulted in the very slight uneven joint. I will try to fix it, but if all else fails (due to my still-very-amateurish skill!) I will export the file in stl and open in Autodesk Meshmixer to correct the issue by "sculpting"! 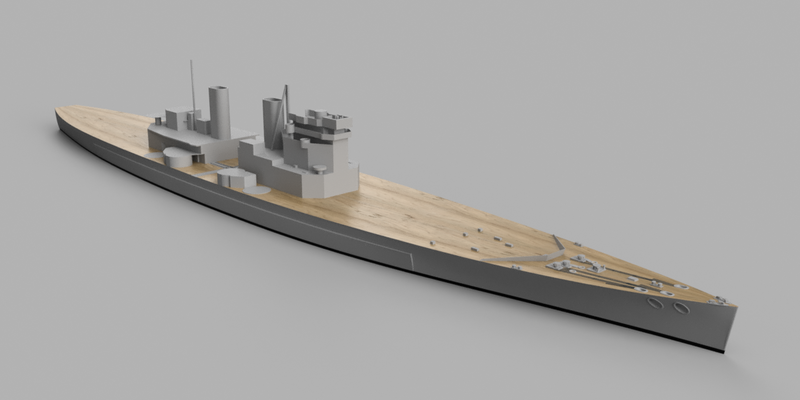 Nice work, If you complete the Lion 3D work would you be interested in selling the hull/Superstructure on Shapeways? I'm sure you'd find buyers. The mount design is being finalised, and will allow the barrels to independently elevate -3° down and 45° degrees up.